Braid is a puzzle-platformer, drawn in a painterly style, where you can manipulate the flow of time in strange and unusual ways. From a house in the city, journey to a series of worlds and solve puzzles to rescue an abducted princess. In each world, you have a different power to affect the way time behaves, and it is time's strangeness that creates the puzzles. The time behaviors include: the ability to rewind, objects that are immune to being rewound, time that is tied to space, parallel realities, time dilation, and perhaps more. A nonlinear fiction links the various worlds and provides real-world metaphors for your time manipulations; in turn, your time manipulations are projections of the real-world themes into playful "what-if" universes where consequences can be explored. The game doesn't force you to solve puzzles in order to proceed. If you can't figure something out, just play onward and return to that puzzle later. Having just completed Braid for my blog (www.backlogkiller.com), I thought I would transfer some of my comments over here to Cheerful Ghost. If you haven’t finished the game and don’t want to have anything ruined, I guess you should skip this post. Although, there’s really not that much to ruin since the entire game is mechanics and puzzle driven. 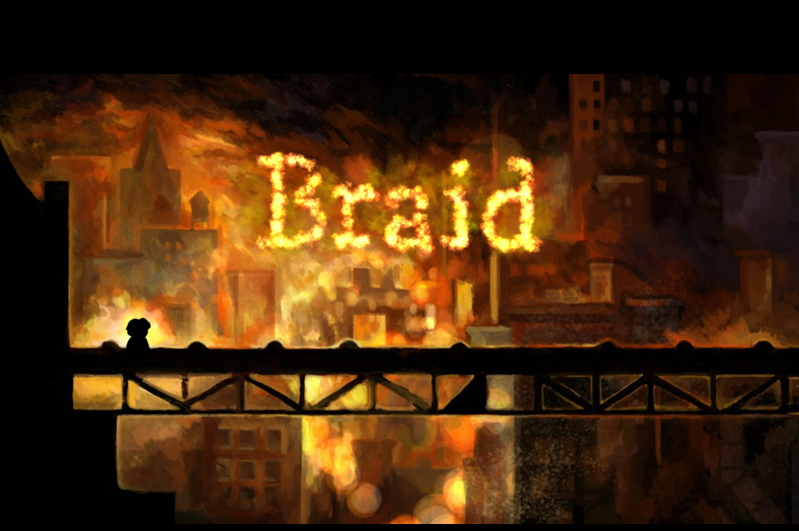 Braid, the brainchild of the (in)famous indie game designer Jonathan Blow, is a puzzle platformer that uses time manipulation as its primary mechanic in addition to the standard running and jumping. By pressing a single button, the player can reverse time to avert death, manipulate entities in the world, and experiment with... Read All Having just completed Braid for my blog (www.backlogkiller.com), I thought I would transfer some of my comments over here to Cheerful Ghost. If you haven’t finished the game and don’t want to have anything ruined, I guess you should skip this post. Although, there’s really not that much to ruin since the entire game is mechanics and puzzle driven. Braid, the brainchild of the (in)famous indie game designer Jonathan Blow, is a puzzle platformer that uses time manipulation as its primary mechanic in addition to the standard running and jumping. By pressing a single button, the player can reverse time to avert death, manipulate entities in the world, and experiment with different solutions. Although this sounds simple, the introduction of new elements such as monsters or objects immune to time control complicates things greatly. Using time reversal and properties unique to each world, the player must control the main character (Tim) to collect puzzle pieces and rescue the enigmatic princess that was lost in the past. Throughout the game, the player is fed small bits of story through strange blocks of text that hint at the identity of the Princess Tim is looking for. This enhances the somber mood of the levels and adds enormous gravity to the metaphor the mechanics of time manipulation work to build. The concept of going back to correct your mistakes and take another path through life is universal and lies in everyone. As a way to represent the desire to recapture a lost love, career, or youth, Braid is very effective and quite touching in my opinion. Unfortunately, the game squanders this chance by making a baffling narrative choice I cannot even begin to understand. The ‘Princess’ in Braid is actually the secret of nuclear weapons. Tim is a scientist who worked on the Manhattan Project that brought about the age of nuclear bombs and the cold war. Even though the metaphor of time makes sense in terms of the desire to put that genie back in the bottle, it is absolutely ridiculous (in my opinion) when slapped on the game. What could have been a poignant and relatable concept is blown out of the water by the torpedo of grandiosity. I don’t understand why this was done other than to say ‘video games can be important’. Importance can take all shapes and sizes. I cannot relate to developing of a weapon of mass destruction, but I sure as heck can relate to wanting to recapture something I’ve lost in my own life. It is easy to see why Jonathan Blow is such a controversial designer. The brilliant game design makes me very hopeful for his new project, The Witness, but it also worries me about what direction it will take. Many great stories have dealt with personal conflicts that give them an even greater impact which may have helped Braid. Despite this, I enjoyed the game and was only mildly let down by the ending since it was such a pleasure to play. One thing you can do with games is make statements. I am glad you spoiled the game here so I could find out what the reveal in Braid is, thanks for that. Does the reveal for Tim's character make sense with the style of Braid? Perhaps not. I found the gravity of a nuclear assault on life and the landscape to be fairly poignant in Fallout. Just existing in an environment can clue you in to what a designer is trying to say. That said, starting with a known concept like a Princess and then flipping that over to have the Princess be undoing something they believe is evil is interesting. Did he start the player out with some regret and baggage or did the reveal just kind of come out of nowhere? The block text kind of hints at regret, but personifies the Princess in a way that makes it almost explicit that it's an actual person. I may have been assuming too much, but it really just came out of nowhere. I think Fallout works as a commentary on nuclear war because it takes concepts we are all familiar with such as anger, violence, and other base emotions and pasts them on a recognizable backdrop. Braid uses a fantasy inspired theme (although there are hints in the artwork) that doesn't really support that kind of left turn at all. I don't usually like to say stuff like this, but it felt like it totally M. Night Shyamalan'ed at the end. Seems you either love or hate that story reveal. I was torn. It was interesting, compelling, and poignant, yet considering the game it was a part of, it didn't quite work. I think had it been done a little differently or on a different kind of game or with a different setting, it would have been awesome. I haven't seen any of his movies since Signs to be honest. No problem, but I get what you mean, total switcheroo but wasn't stylistically earned. One of the first games I heard being touted as proving games can be art, and with good reason. The platforming is solid, the time manipulation mechanics work exactly as expected, the puzzles are challenging but satisfying. But the true stars of this game are the story, which is very thin but compelling at the same time, with a hell of a twist-ending, and the artwork. The game looks like nothing else, and has inspired a new sub-genre of artistic platformers. This is easy to knock out in just a few hours, so it's great for a Sunday afternoon with nothing to do. One of the first games I heard being touted as proving games can be art, and with good reason. The platforming is solid, the time manipulation mechanics work exactly as expected, the puzzles are challenging but satisfying. But the true stars of this game are the story, which is very thin but compelling at the same time, with a hell of a twist-ending, and the artwork. The game looks like nothing else, and has inspired a new sub-genre of artistic platformers. This is easy to knock out in just a few hours, so it's great for a Sunday afternoon with nothing to do. I wouldn't say I have played it... I played a bit of the original one, but not the re-release with some financial backing. I still need to get to it. It was on one of the big Humble Indie Bundles. What about limbo? That was another good artful platformer. I got the demo on the PS3. I liked it. I didn't get attached to it enough to nab it. Cool, ill check it out. It really is quite straightforward. I can't think of anything I could recommend, as learning the mechanics is, to sound a bit cliche, an organic process. Do I have to wait for the end for a payoff? I have some material to write about... but I'm in World 6 and I haven't seen that mindblowing thing people are talking about besides the clever mechanics and permutations thereof. I'm not sure what mindblowing thing people were talking about, but I can say that there is a pretty big payoff at the end. I think I'm on the last world now (1). It's pretty good mechanically but I thought there was more to the story rather than some elliptical creative writing... maybe I'm tipping my hand here.